Portable convenience in a pod with a shaker. Well, it's happened: there's a meal replacement that looks even less like food than Ambornite, Soylent, or Ample Meal. 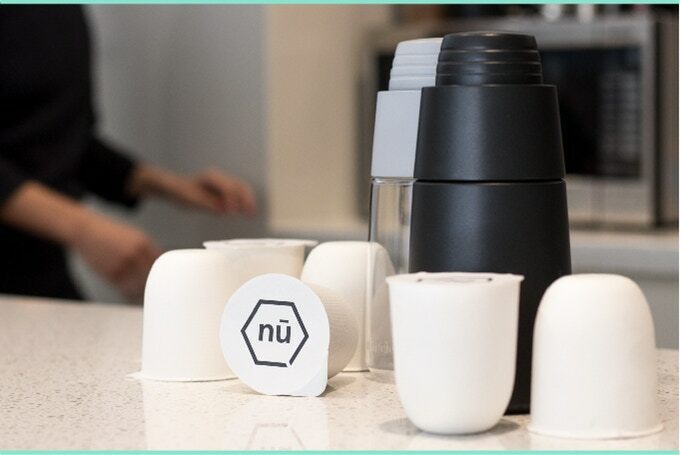 When you buy it, the Nū Pod comes in this sterile-looking white capsule, and it looks like the official nourishment source of the dystopian future. Process-wise, it's not so different than the other meal replacements' powders: you put it in water and shake. However, even the mixing system is futuristic-looking for the Nū Pod: the pods come with a special Nū Pod shaker, so that you slot the pod into the top compartment, pop the top into the body, and push down. One of Nū Pod's big focuses is nutrition. It's made with a pea-based protein, fiber, vitamin and mineral supplements, palatinose, which is a carbohydrate with a lower glycemic index than carrots, and almond meal for vitamins and monounsaturated fats. It's worth knowing that, though these are marketed as a meal replacement, they're only 360 Calories each, so you would have to drink five and a half in a day to make 2,000 Calories. The ingredients list is chock full of polysyllabic science-y words. You'll be drinking things like "Ferric Pyrophosphate," "Sodium Molybdate," and "Zinc Sulphate Monohydrate." You can back the project now at its Kickstarter to get your first pods next May or June. AU$15 (about US$12) will get you the shaker without any of the pods. AU$40 (about $31) will get you 6 Nū Pods and the shaker, with free shipping, which is actually pretty good: even including the price of the shaker, each of those meals only comes out to about US5. On the steepest end, AU$1,610 (about US$1,260) will get you 360 pods (12 30-packs), two shakers, and a tee shirt.